Handheld GPS systems are becoming multi-function navigators that can take you into the woods, back out again, then on the road in your car with optional turn-by-turn navigation. Whether you're a hiker, camper, boater or geocache enthusiast, there are plenty of handheld GPS systems out there that get the job done right. The Garmin Oregon offers a slick, touch screen with electronic compass and barometric altimeter. The latest models also include turn-by-turn navigation for your car, a built-in geotagging camera and up to five different profiles, so you can customize the device to work for whatever outdoor adventure you're on. The DeLorme PN-60w comes with a built in satellite communicator, give you the option of making calls with or without a cell phone or cell service. The device also allows texting and posting to Facebook and Twitter. Additional subscription services are required for these options and for additional maps. The Garmin Dakota is a smaller, less expensive version of the Garmin Oregon. It also offers a touch screen and many of the options available on the Oregon, but in a smaller size with additional battery life. For those who use their handheld GPS for primarily outdoor use, the Garmin GPSMAP 60Cx is a rugged, durable option with plenty of power. No touch-screen here, this device is meant to be used hard. It includes a 64MB memory card, allowing you to store an impressive number of maps, including some for city driving. The DeLorme Earthmate PN-40 has a bright, easy to read screen and a waterproof case, making it perfect for hiking and geocaching. The coordinates are accurate, making it perfect for boating as well. For anyone looking for an entry-level, easy-to-use device that allows you to update maps as you go, the Garmin eTrex is for you. 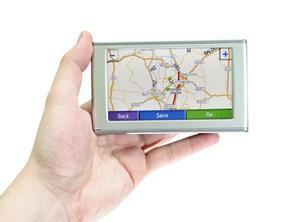 It comes with 24MB of memory, allows you to add in city maps and stores up to 50 routes at a time. The Magellan Triton 300 is a waterproof handheld device with a full color screen and directional pointer. The compass screen accurately helps you pinpoint your location, while its small size helps it fit in easily with whatever gear you're carting. The Bushnell Onix 400 is a high-tech device that includes satellite photos of the route you're on, along with satellite radio and XM NavWeather. The exterior is rugged and encased in rubber, while its larger size gives a clear screen display. The various locating tools are layered within each satellite photo to help you get where you're going quickly and accurately.